Where better to find an awesome Sunday brunch than a joint that deals in the delectable goodness of the old south? Yes, we’re talking about Shango. Deep, rich southern flavors just scream HANGOVER CURE… not to mention delish. We stopped in recently for some of the best morning chow we’ve sampled anywhere. 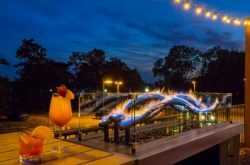 It’s a no brainer really, as Shango serves up awesome eats in the evening too. 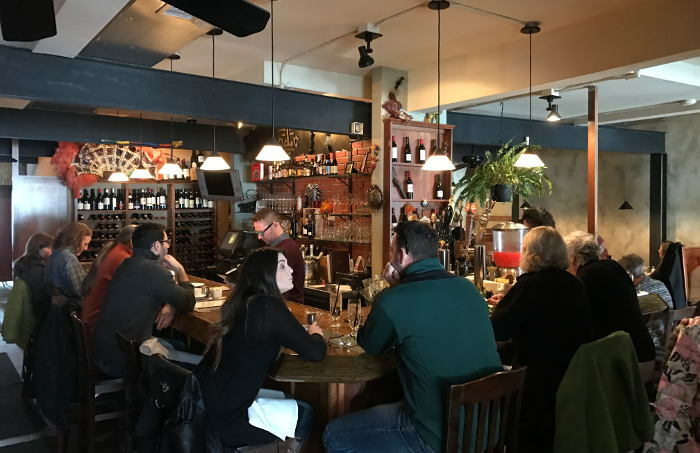 For those of you who are not aware, Shango Bistro & Wine Bar (New Orleans style) has been serving up fantastic southern cuisine on Main Street near UB South for years now. 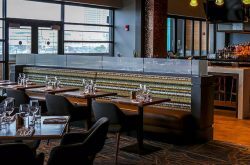 Shango’s Chef/owner Jim Guarino also opened up the acclaimed seafood restaurant Oshun in downtown Buffalo circa in 2014. We stopped into the former to a full house at 11:30 am. 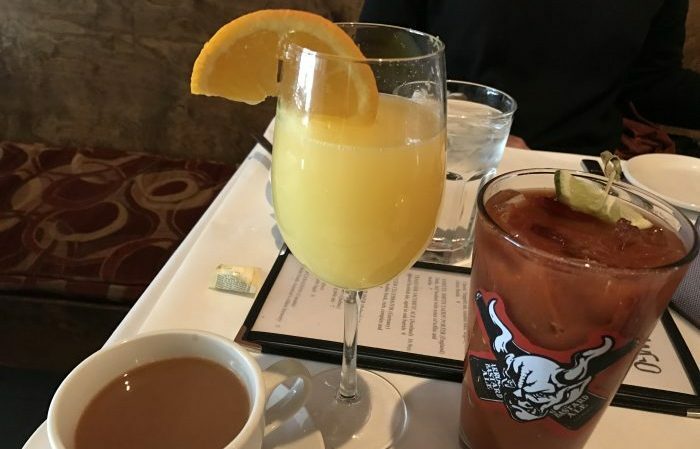 Notice how brunch time has inched up since NYS moved the adult beverage rule to 10 am? 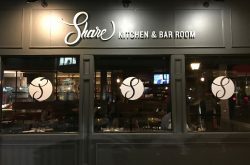 Shango is a very comfortable, flavor-forward dining experience that serves beer and wine, with excellent options in either. Concerned about the bloody? Don’t be. They make a beauty using sake – nice, spicy, and eye-opening. 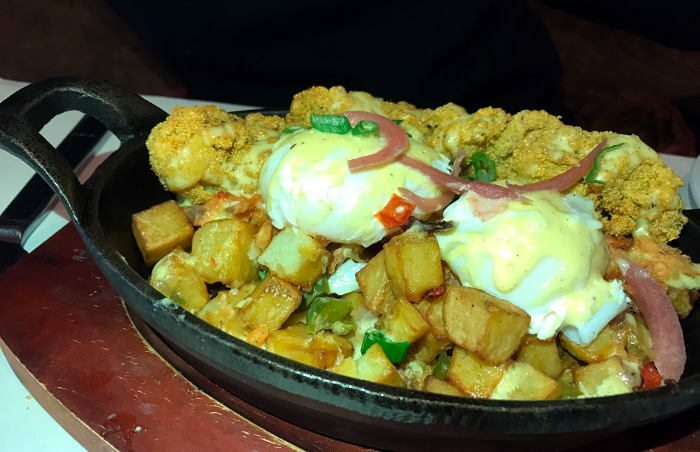 The brunch menu is something your Aunt Bee (insert random auntie name here) would be proud to serve up – gumbo, pork belly, grits, lobster cakes, fried chicken, shrimp, biscuits and plenty more. We started with some coffee, a Bloody Mary, mimosa and a truly outstanding bread basket. 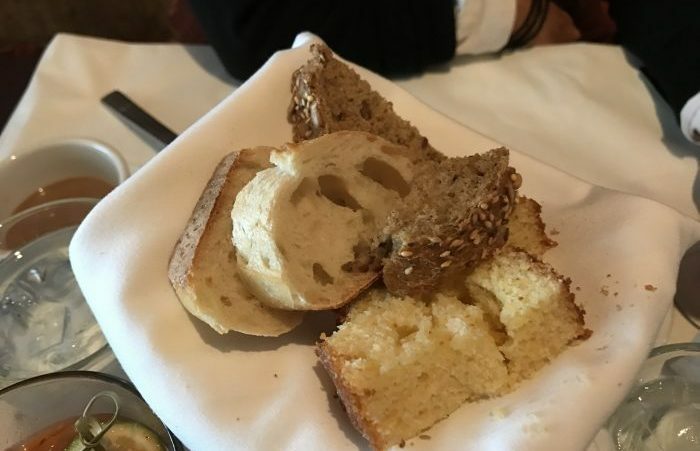 The corn bread stole the show. 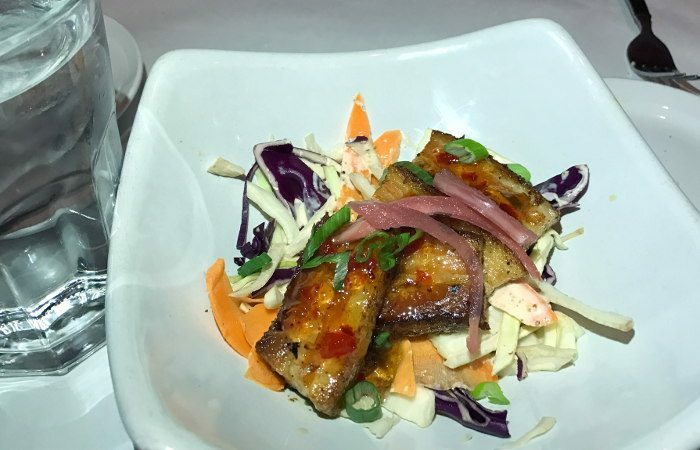 Pan Seared Pork Belly ($10) with brussel sprouts and apple slaw, pecans, five pepper jelly. Perhaps not a normal brunch option, but the menu offered appetizers so we felt obligated to order. One of our better moves, the sweet of the jelly with the sour of the slaw and the richness of the pork is the perfect way to start a Sunday morning. Poached Eggs over Smoked Salmon Hash ($14) with cornmeal fried oysters and hollandaise sauce. While this may sound a bit fish front for some Sunday mornings this was a huge winner today. The smoked salmon goes strangely ell with the potatoes and egg and these oysters are so sweet it almost seems impossible they were fried. 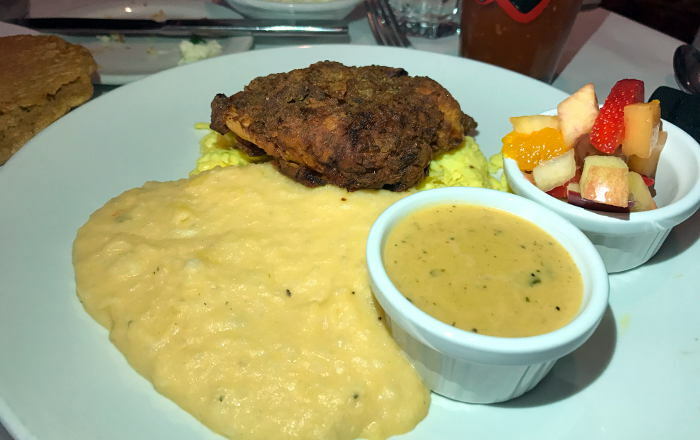 Buttermilk Fried Chicken, scrambled eggs, cheddar grits and Andouille country gravy ($14). Loved the grits, the eggs were nice, the fried chicken stupendous. Really, a boneless breast so tender and juicy who would miss the bone, and it had a little heat too. The gravy is great too. I should have saved some bread. 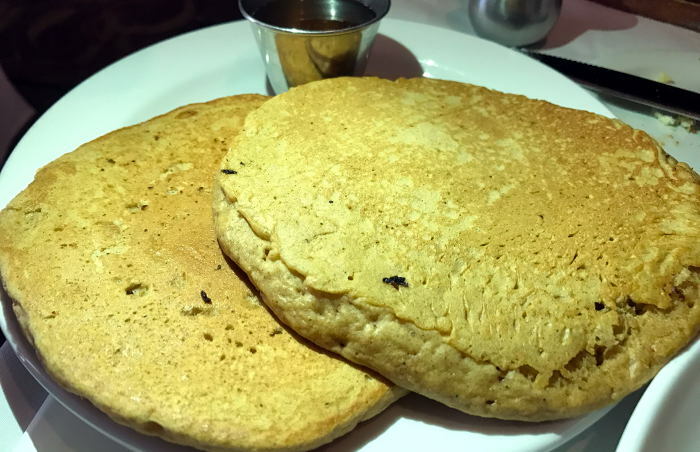 Sweet Potato Pancakes ($5) as a side. Fluffy and sweet these are so much better than standard pancakes, why would anyone make anything else. NO – we did not get the Beignets for dessert. Yes, we were torn but we were also really full. Not to worry, there is talk about going back next week. There were so many things on the menu we missed.